Spain offers an incredible variety of cheeses and Extremadura is representative of this to such an extent that the National Cheese Fair is held every year in Trujillo's lovely main square. It's a great event where the general public are allowed to get their taste buds dirty trying both regional cheeses and products from all over Spain. So which cheeses from Extremadura are worth highlighting? Well, there are many excellent mature and soft ones made using sheep's, cow's and goat's milk, such as the lovely goat's cheese from the Trujillo area, called Ibores. 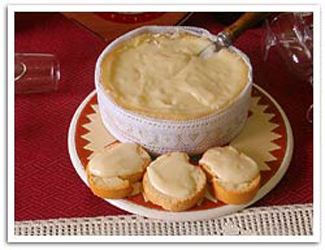 However, one type of product arguably stands out: the soft sheep's cheeses called Torta del Casar (from northern Extremadura) and Torta de la Serena (from the south-east of the region) are unique and outstanding. As a stand-alone dish they are best served as a "scalped" whole cheese to be shared rather than as individual 'canapés'. Everyone is allocated a teaspoon, some toast and it's time to start scooping, spreading and scoffing! Tortas shouldn't normally need heating up to obtain their creamy texture. Restaurants who do so have often disappointingly frozen them beforehand and then microwave them to order. Many local chefs also use tortas as ingredients to enhance their dishes, mainly in gorgeous (if powerful and pungent) sauces to accompany steaks and cuts of ibérico pork.